Myofunctional orthodontics is focused on the root cause of crowding and bad bites, also known as malocclusion. The primary cause of crooked teeth is the lack of or overuse of muscular forces. These muscles include the tongue, lip and cheek muscles. Proper breathing, correct swallowing, and an ideal resting tongue position can eliminate the need for any metal or non-mental orthodontic teeth-straightening program. The MyoBrace system includes a small device similar to a mouthguard that helps train the body to properly position the tongue, lips and cheeks, and, therefore, helps naturally grow the jaws and allow the larger adult teeth to come in straight. Along with daily exercises, the results are, not only beautiful, but also long-lasting. There is no need for retainers when the muscles naturally keep teeth in their natural position. "Crowding of the teeth is typically caused by small jaws or delayed jaw growth, which in turn is caused by the tongue resting in the wrong position in the mouth," states Dr. Im. "It's no wonder most people don't have room for the last teeth (wisdom teeth) in their mouth. There isn't enough room because the jaws never fully developed. Not only that, but many kids get their teeth pulled just to make space to fix the crowding. Imagine removing 4 to 8 perfectly good teeth just to straighten teeth. That is still a common practice today. Instead of just helping the jaw grow to its full size, dentists and orthodontists alike are needlessly pulling healthy teeth or stunting normal growth because 'it's what we've done for years.'" By offering MyoBrace to patients across a variety of age ranges, Dr. Im is providing a natural, safe solution to crooked teeth, overbites, and underdeveloped jaws. "If there's a way to do things naturally -- and get the same or better results -- then we want to go that route. And MyoBrace not only fits that criteria, but it also addresses the root cause of the issue, which is always the best long term solution to our health problems; if we only address the symptoms without addressing the cause, we never really solve the problem." The point of this treatment is to retrain the muscles so the bones grow better and the teeth get straighter. How do you teach this to kids? Just like we teach dance or piano or tennis: Lessons! They are given simple time-limited exercises to do regarding lip tone, tongue position, swallowing, and so forth. They must practice these at home to get the most benefit from them. There are also group and private lessons for various issues. That's how important the muscles are! This is a light-wire, gentle, intermittent force expander that give a boost to the work the Myobrace is doing, essentially, but helping crowded teeth spread out and give more room for the tongue. It is the one expander that allows tongue training to happen while it's being worn - others are just too bulky for the tongue to sit on the palate properly. It is adjusted by the doctor on a monthly basis and is worn for about 4-6 months. ALF (Advanced Light Force) is a method to align teeth and improve the bite without braces. ALF is a holistic treatment oriented to the whole body. Rather than traditional braces, patients receiving ALF treatment are fitted with a custom-made, removable appliance. The appliance uses wires to reposition dental arches, jaws, and teeth. ALF treatment focuses on three phases. Phase One involves correcting cranial distortions by means of the ALF appliance. Phase Two uses the ALF appliance to correct the structural distortions of the upper jaw. 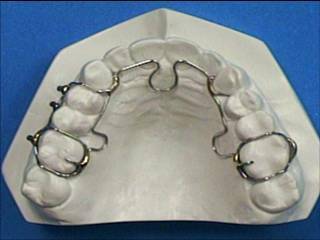 Phase Three may require the use of the ALF appliance and/or traditional braces to realign the teeth, improve teeth and jaw function and improve the patient’s smile. ALF is more than just a way to create a gorgeous smile; it's a preventive approach to improve your overall health. ALF treatment can improve your airway health, improve your posture, minimize your risk of TMJ problems, and reduce your risk for snoring and obstructive sleep apnea.